This article is about the corpse in Hag's End. For the randomly encountered one, see Assassin. 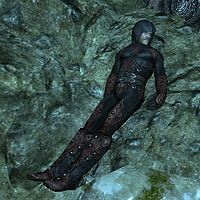 The Dark Brotherhood Assassin is a long-dead Nord bandit found behind a sliding wall in a hidden alcove revealed by pulling a handle behind the throne, in the throne room of Hag's End. Olava the Feeble will have a vision of his final resting place if you earn a bonus during the Dark Brotherhood quest Breaching Security. He is clad in a complete set of unique Ancient Shrouded Armor. Despite being supposedly long-dead, the Assassin's remains show no signs of decay. It is also possible to obtain the Ancient Shrouded Armor by using The Ritual Stone power. Activating the power near the body will raise it; exiting the cell within two minutes (for example, exiting to the Deepwood Redoubt balcony) will cause the body to follow you outside. Once the power wears off, you can loot the body for the armor. This page was last modified on 8 August 2015, at 16:36.